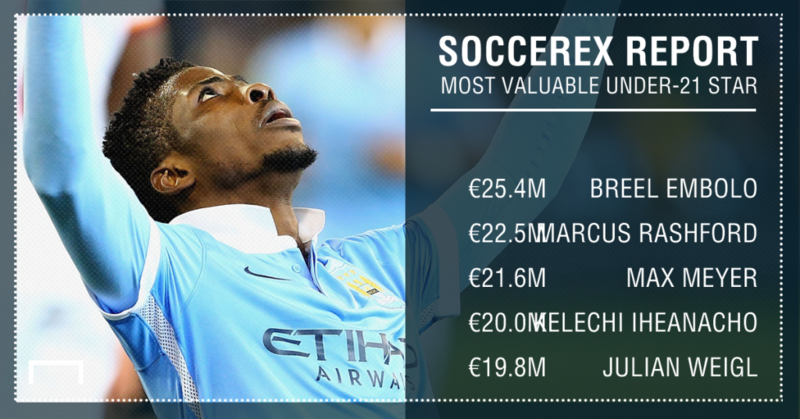 Manchester City forward Kelechi Iheanacho has been voted the ninth Most Valuable Under-21 Player in the world, according to a Soccerrex report from Prime Time Sport. The 19-year-old who joined Manchester City in 2013 after he helped Nigeria win the U-17 World Cup has gone on to fulfil his huge potential at the Etihad. neighbours on the premier league log. His goal per ratio last season was better than that of Cristiano Ronaldo, Lionel Messi, and Robert Lewandowski and this have seen his value rise to €20million. On top of the 20-man list is Manchester United’s Anothny Martial with €47.1m, followed by Schalke youngster Leroy Sane (€34.5m) while Tottenham Hotspurs midfielder Dele Alli made the top five.